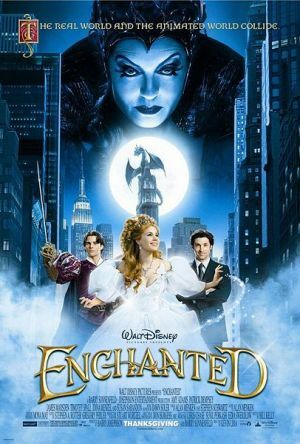 I recently reviewed Enchanted by Alethea Kontis, and by complete coincidence, I also just watched the Disney movie Enchanted. No connection besides the name! But dare I say it was…enchanting? 🙂 It’s also a great fit for Once Upon a Time! I’ve seen Enchanted at least twice, but it loses none of its charm on repeated viewings. The movie is essentially Disney poking a bit of gentle fun at Disney. Starting with an oh-so-sweet animated sequence about Giselle, her forest friends, and her handsome prince Edward, everything changes when the wicked queen banishes Giselle to “a place where there are no happy endings.” Giselle finds herself in the middle of Times Square, and in live-action as Amy Adams. After scrambling through New York a bit, she encounters Robert (Patrick Dempsey), who reluctantly tries to help her at the urging of his six-year-old daughter. Meanwhile, Prince Edward (James Marsden) comes to New York to find his lost love, accompanied by Giselle’s chipmunk friend Pip, and pursued by Nathaniel (Timothy Spall), who secretly is working for the evil queen (Susan Sarandon). Chaos, hilarity, romance and a dragon all ensue. This movie is so much fun on so many levels. There are fairy tale and Disney references galore, with poisoned apples, a wicked queen resembling Maleficent, and of course a dropped slipper. Giselle’s forest friends seem to include animals from several other Disney movies, like mice, racoons, rabbits and deer. The themes are in some ways even better, taking trends from the early Disney movies (like the incredibly rapid romances of, say, Snow White and Cinderella) and stretching them to absurdity. The characters are really brilliant as well. I love the way Giselle and Robert start out as complete opposites, and then both influence each other for the better. Giselle believes unreservedly in true love and romance, and sees beauty and goodness everywhere. Robert is jaded and cynical, practical to a fault. Together, Giselle begins to tap into deeper, more meaningful emotions, while Robert finds unexpected romantic depths. And then of course the supporting cast is hilariously funny. Edward is beautifully, blissfully oblivious and self-absorbed, and charges about through New York in a wonderful way. One of my favorite moments may be when he stabs a bus, mistaking it for a monster. Nathaniel, on the other hand, begins to question the nature of his relationship with the evil queen, and I love it when he calls into a radio show to pour out his problems. As to the evil queen, Susan Sarandon appears to be having a wonderful time camping it up, fantastically villainous and over-the-top. All in all, Enchanted combines lots of my favorite things in fairy tales–clever references to spot, lots of humor, characters with complexity, and of course, an acknowledgement of all the wonderful strangeness of the original versions! Don’t forget, you can win a signed copy of my fairy tale retelling, The Wanderers! Just put #WanderersGiveAway in your comment to enter. The obliviousness of Amy Adam’s character is enchanting. (Fans of hers might want to check out Miss Pettigrew for a Day as well in which she is again clueless in a benign way.) Anyhow, you made me want to see this movie again. Isn’t it fun? 🙂 I’ve seen Miss Pettigrew too, also a nice one! Amy Adams has been great in a lot of movies. I saw this once and remember liking it, especially the parody aspects. I should watch it again! You’re right, it’s a great fit with Once Upon a Time VIII. I loved Disney’s self-parody in this movie. It is hilarious and also kind of sweet. I adore Pip, every Disney film needs that animal-bestie, doesn’t it? Great review, I need to re-watch this! I’ve never seen this one – but I’m going to do so now! It is fun! Light hearted. Larger than life. With some nice serious life lessons woven in. But for me, the best part is watching for all of the previous Disney references! I love this movie too; it’s so fun! I’ve watched this many times with my granddaughter! Good fun! I saw about 20 minutes of this once, and I’ve been meaning to rent it from Netflix ever since. Thanks for the reminder – it does indeed sound “Enchanting”!